Bill passed away on April 12, 2019 at the age of 87. Bill faithfully served our Country in the US Air Force and was stationed in Okinawa. He was a member of American Legion Post # 529 in Four Seasons. Bill was a dedicated husband, father, and grandfather. He was a tireless gardener, an avid reader, and an all around handyman, and master of the art of puttering around.Bill was a dedicated husband, father, and grandfather. He was a tireless gardener, an avid reader, and an all around handyman, and master of the art of puttering around. Bill is survived by his devoted wife Alyce, and many children and grandchildren. Viewing will be at O’Brien Funeral Home, 2028 Highway 35, Wall on Friday April 26th from 4-8 PM. A Mass of Christian Burial will be at St. Peter’s Church, Forman Avenue, Pt. Pleasant, on Saturday, April 27th @ 11 AM. 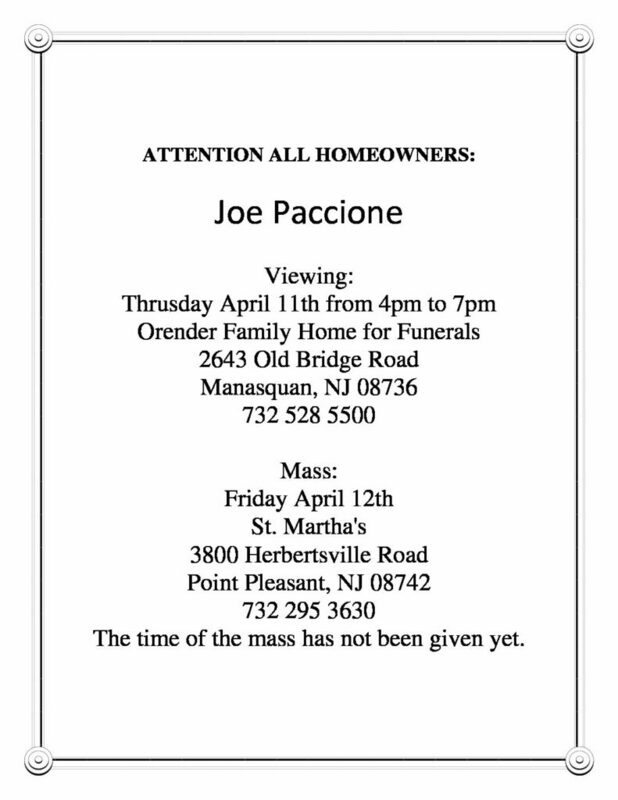 Private burial will take place the flowing day @ NJ Veteran’s Cemetery. In lieu of flowers, please donate to Alzheimer’s Association (www.ALZ.org). Louis Aiese died on March 26, 2019. There will be a viewing @ O’Brien Funeral Home, Rte. 35 in Wall on Friday March 29, 2019 from 2-4 PM & 7-9 PM. 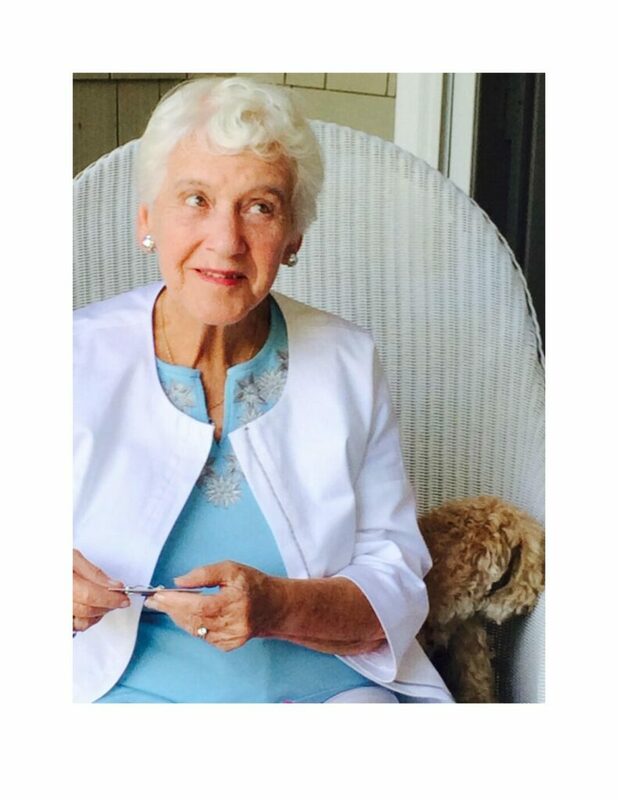 Clare Schlich, 82, of Manasquan, NJ ad formerly of Ridgewood/Oakland, NJ died on March 4, 2019. Clare was born in NYC and taught in the NYC School System, Bergen County, and taught in Paterson High School’s Alternative Education Program. Clare was also a guidance counselor at the NJ Youth Corps & retired in 2002. Clare is survived by her husband of almost 60 years, Edward (Ted) Schlich, and their children Edward, Mare Clare Garber, Rosemary Sizar, and Margaret Ann Schlich. She is also survived by 6 grandchildren. A Memorial Mass will be held at St. Denis Church, 90 Union Avenue, Manasquan, NJ on March 22nd, @ 10 AM. Donations to the Alzheimer’s Association is Clare’s memory will graciously be appreciated in lieu of flowers. Thomas F. Neary, 85, died on Thursday, January 10, 2019. Thomas was a Vice-Principal for Roosevelt High School on Long Island, and was a veteran of the Korean War. He was a member of St. Martha RC Church in Point Pleasant. Thomas is survived by his wife of 59 years, Patricia, his children and grandchildren. Visitation will e on Sunday January 13, 2019 from 2-5 PM at Neary-Quinn Funeral Home, 39 South Street, Manasquan, NJ. A Mass will be offered on Monday, January 14, 2019 @ St. Denis Church in Manasquan. In lieu of flowers, donations may be made to the Parkinson’s Foundation. James (Jim) Georges passed away on Monday 12/24/2018. Jim was a graduate of Lehigh University with a degree in engineering. He served in the U.S. Army as a Lieutenant in the Engineer Corps serving in Korea from 1953-1955. Jim ran a successful business and wrote a sports column for the local newspaper and never missed his children’s events. He was a dedicated blood and platelets for donor and achieved membership in the “million pint club. Jim is survived by his wife of 60 years, Eileen, as well as his three children, 5 grandchildren, and 2 great grandchildren. The funeral service will be on Sunday 12/30/2018 at Orender family home for Funerals, at 4 PM. Interment will be at 11:30 on 12/31/2018 at Brig. Gen. William C. Doyle cemetery in Wrightstown, NJ. We received information that Dr. Robert Krantz passed away at his home on December 20, 2018. He is survived by his wife Bobbi; his children and grandchildren. Funeral services will be held on Sunday, December 23rd 10:30 AM at Temple Beth Am Shalom, 1235 NJ 70, Lakewood, NJ. Interment will immediately follow at Beth Olam Memorial Park, Rt. 70, Lakewood, NJ. John Tirpak passed away on December 19, 2018. A wake will be held at Orender Home for Funerals on Wednesday, December 26, 2018, between 4 – 8 PM. Funeral Mass will be at St. Martha’s Church @ 9:30 AM on Thursday, December 27, 2018. Mike Simko, an original 4 Seasons resident and founder of Post 529, passed away on Friday 10/12/2018. He was a Veteran an served proudly in WWII earning an American Area Campaign Media; Asiatic-Pacific Campaign Medal; and WWII Victory Medal. He served aboard the USS LST 52; and USS NIAGARA.